On grimy city streets, salted highways, dusty backroads, or wet, muddy trails, your vehicle can be exposed to extreme elements and harsh substances every time you use it. 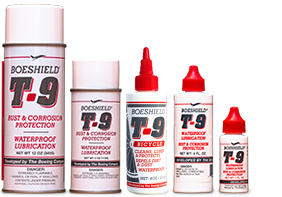 Boeshield T-9® provides waterproof lubrication and protection against rust and corrosion throughout your car, truck, SUV or motorcycle. T-9 is tough yet completely safe for paint, plastic, rubber, fiberglass or vinyl. Use it on all kinds of metal, as well as on wiring and belts, or to loosen rusty nuts and bolts. For use on engines, apply T-9 when the engine is warm but not running. Allow a few hours to dry before restarting to make sure the propellent has evaporated completely. Tough but safe. T-9 will not harm paint, plastic, rubber, fiberglass or vinyl. It can be used on engines, wiring and belts. T-9 is nonconductive and will not cause short circuits, so it’s also safe to use on electronics. To use T-9 on engines, apply when the engine is still warm but not running.